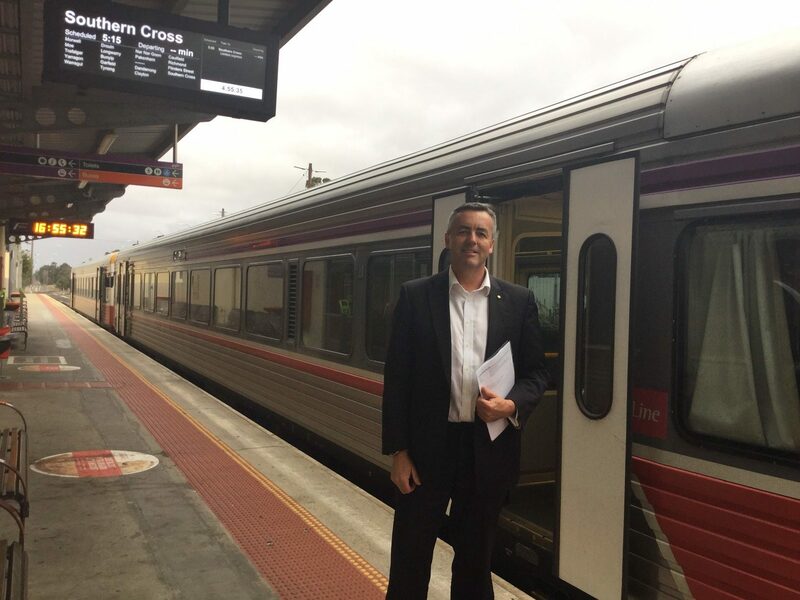 Member for Gippsland Darren Chester at Traralgon Railway Station recently. Mr Chester says the Federal Government is committed to funding regional passenger rail upgrades. PEOPLE living in the Latrobe Valley can be assured the Nationals, as part of the Federal Coalition Government, are committed to funding better regional rail services in Gippsland. All levels of government and the community agree on the need to upgrade the Gippsland Line; there is just a dispute on how we get there. As your local MP, and Transport and Infrastructure Minister, I look forward to making announcements related to Gippsland transport infrastructure in the Federal Budget next week. Although public transport is primarily the responsibility of the Victorian State Government, I believe it is right for the Federal Government to play a role in helping to make our region a more attractive place to live and invest, by boosting regional passenger rail. The debate relating to the Gippsland Line over the past week has been confusing for many people locally, due to questions over how the upgrades would be paid for. On Sunday, the Victorian Government announced a $1.4 billion state-wide package for regional rail, to be paid for entirely by the Federal Government, under the now closed Asset Recycling Initiative (ARI). Premier Daniel Andrews did not commit a single cent of state funds, and the ARI is now closed. However, this does not mean all hope is lost for Gippsland Line funding. First, we will need to see a plan and a business case, which is yet to be delivered to the Federal Government. I am confident there will be other ways for the state and federal governments to work together to fund the upgrades – which I’m committed to doing. But this means we will also need to see a contribution from the Victorian State Labor Government to regional rail, using its own money. If State Labor can pay for the Melbourne Metro and Level Crossing Removals in the suburbs, it can also spend state money on regional rail for Gippsland. They have done it in the past, and they can do it in the future. That’s the fair thing to do. I understand many people don’t care who pays for the rail upgrades; they just want to see the work done. I have some sympathy for that point of view, but I have to get value for money for the taxpayer, and the Victorian Government can’t expect a free ride. I am confident we can reach an agreement in the weeks ahead. Darren Chester is the Federal Member for Gippsland, and Minister for Infrastructure and Transport.